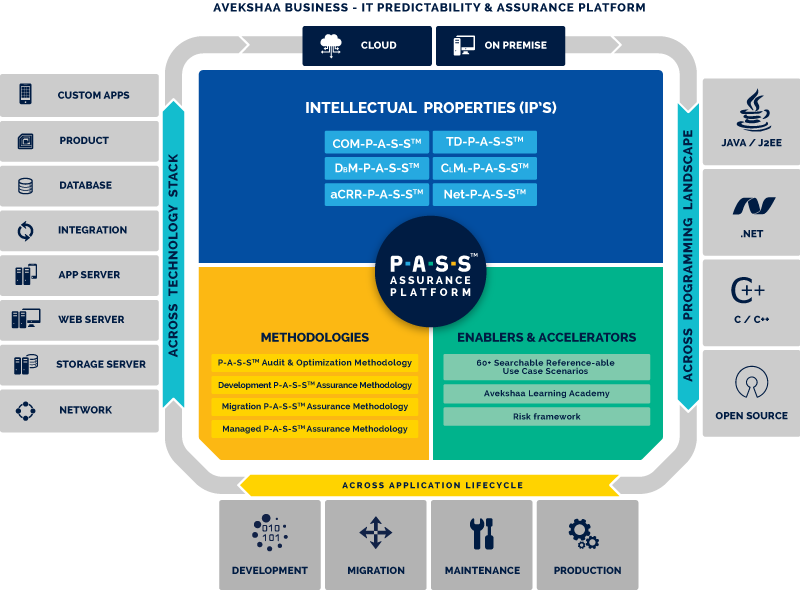 Avekshaa's unique, core technology platform "P-A-S-S™ Assurance Platform" uses an innovative and disruptive approach to manage IT complexities across the four pillars of Performance, Availability, Scalability and Security (P-A-S-S™). The P-A-S-S™ Assurance Platform is best suited for wide range of IT systems and applications; from complex integrated environments to off-the-shelf application suites, from legacy applications to cloud solutions, with current as well as new IT systems. The platform is built using company's core IPs, proven methodologies, knowledge base of use cases, and real life scenarios. Avekshaa's P-A-S-S™ Assurance Platform supports solutions across all phases of the Application Life Cycle: development, maintenance, and production phases, and are adaptable across all delivery models (e.g. Agile, DevOps, etc.). Our P-A-S-S™ assurance platform helps us to rapidly analyze and isolate issues across the technology stack, engage with the impacted technology layer through a data-driven approach and resolve complex technology issues in a timely manner, and helps us to consistently deliver results. COM-P-A-S-S™ is an automated performance modeller that is built on our experience in modelling some of the largest IT systems across the globe. Building mature models that can predict performance levels is a highly specialized skill that is acquired through experience from multiple projects. The tool provides the perfect platform for taking objective decisions related to hardware augmentation, and is an early-warning system for avoiding performance and scalability issues from disrupting business. For a production system - getting early insights into the IT system's potential failure points. For a system under development - getting early insights into the system's capability to scale, without waiting for the system to be built and performance tested. This is critical for addressing Architectural issues since the cost of fixing these in production can be 100 times the cost of fixing them earlier in the life-cycle. Identifying the right bottleneck components so that hardware augmentation yields maximum ROI. How will the system perform if the volume doubles in the next year? How will system perform if I add more CPU's to the application server? How much more hardware is required to maintain the SLA's at additional 50% load conditions? Our Cloud based P-A-S-S™ Analytics leverages existing APM tools and provides insightful information for identifying bottlenecks across the various layers in the environment: web server, application server, code, database, network, etc. P-A-S-S™ Analytics is composed of Data Collection Engine, Data Modelling framework and Analytics components. The Analytics engine comes in-built with various common failure patterns and rule-sets that are constantly updated based on our experience from various projects, making it progressively more intuitive and insightful over time. It also has self-learning capabilities that use issues identified over a period of time as a basis for building intelligence. P-A-S-S™ Analytics helps in swift analysis, performance engineering and monitoring activities, and capacity planning. P-A-S-S™ Analytics helps in analysing the most complex issues across the technology stack, e.g. connection leaks, network bottlenecks, thread contentions, database holder events, server crash events, high CPU utilization issues etc. Identifying the exact location of connection leaks. Identifying potential causes of high CPU utilization in the code. Identifying bottleneck devices on the network. It is commonly found that Technical teams struggle to get an appropriate solution to the identified issues. The Avekshaa P-A-S-S™ Analytics addresses this problem by providing a set of recommendations for the identified issues. The recommendations are based on a comprehensive rule-set that incorporates our many years of experience in solving performance issues. While enterprises put a lot of emphasis on monitoring performance levels of online transactions and interactions, batch operations are often neglected. Gathering intelligence about batch performance and whether it is degrading over time is usually missed. The Avekshaa P-A-S-STM BatchMon performance monitoring tool addresses this gap by providing a configurable framework for collecting metrics that can be used to monitor and illustrate batch performance levels over a period. The Monitoring tool comes in-built with a pre-configured setup for monitoring Finacle batches. However, the tool is configurable and can be customized for any other batch system. Easy configuration for most batch operations. Single graphical interface to monitor the performance levels of various batches in the enterprise. Trend analysis capabilities to identify batch operations that are degrading over a period of time. Complex distributed applications are a reality today. Failure or degradation in downstream applications is one of the most common causes of failure in upstream applications. For example, a CRM that is not performing optimallycan potentially cause failuresinthe Internet Banking channel which depends on the CRM. Avekshaa IntgApp P-A-S-STM intelligently monitors downstream applications that are integrated with the core application, with minimal CPU and memory overhead. The tool provides a feedback loop to the core application which can then fail-over in a graceful manner, or isolate the problematic application by temporarily suspending traffic. Helps in quickly isolating problematic applications and stops cascading failures in integrated applications. Improves resiliency of the core system. Real time monitoring with minimal overhead. The tool is highly configurable and can be setup based on the needs of the application: sampling frequency, data collection modes, algorithms can all be customized to suit the application. The tool comes integrated with an alerting engine and JSON based event triggers that can be passed to the core application for corrective actions. The tool provides a unifieddashboard to view the health of various applications in the IT system.